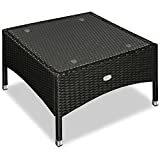 Rattan coffee tables are an astonishingly cute addition to your outdoor furniture and accessories as they are weatherproof and strong enough to last you for a very long time. 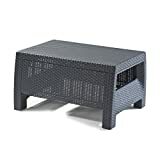 Rattan coffee tables are made from woven material which not only makes them strong and ideal for all weather conditions, but also, they are light and safe for households with people, of all ages. If you have an idea on what it takes to be an owner of rattan furniture and if you have a good eye for details and appreciation for fashion and style, then you will definitely want to not only invest in rattan coffee tables but also, everything rattan including dining sets for example. This would obviously depend upon your budget given that rattan furniture are usually more expensive than other common furniture types. 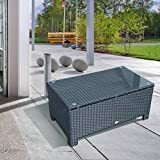 Rattan coffee tables are available in different sizes and designs so you will need to have an idea on which one you should be opting for based on the amount of space that you may have available at your backyard. You will also be able to find rattan coffee tables that are square, those that are rectangular as well as those that may be round of oval shaped. This is common with all types of furniture so you would definitely have your own preferences for them. But be sure to only proceed after careful research so you do not rush into buying a coffee table only to find a better and more peasant one later. The idea is to proceed with care and after an exhaustive research so you are entirely satisfied with your purchase. Some people are naturally better in these things than other which is why most shoppers would share ideas with their colleagues and family members before choosing one to finalize their purchases. 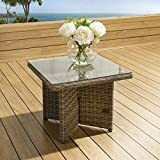 Sleek poly rattan side table with glass table top. Suction cups prevent the table top from sliding. UV and weather resistant wickerwork, suitable for the outdoor area. Sturdy frame made of steel and feet made of aluminum. Elegant design and fast and easy assembly. Made from fully weatherproof PE rattan, hand woven over a rust resistant frame. This maintenance free table is designed to be left outside all year round without the need for covering. The frame is made from 1.2mm thick aluminium tube with grey powder coating applied after welding. Any dust or dirt can be easily washed off with a hose pipe or power washer. 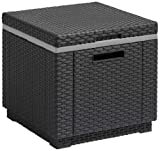 It is UV light resistant to ensure that the coloured rattan does not fade in the sunlight. Please do not mistake this for cheaper versions on the market, our quality is the best. 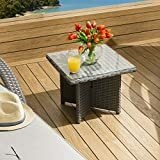 Our flat and half round longlife rattan is super durable, our fabric is 0.5mm thick (normal = 0.3mm) and all our items have double stitched cushions, stainless steel labels and high quality covers. Our fabric and Foam in fully compliant with UK Indoor Fire Regulations. 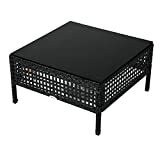 This table can be freely combined with other rattan furniture to be a set. Please select other parts from our store. Covered with 5 cm tempered glass. Small size and sturdy structure. Overall Dimensions: 60L x 60W x 33H (cm). Assembly required. The price is only for the table. It can be freely combined with other rattan furniture to be a set as illustrated in the picture. Please select other parts from this listing.